55 SANSON, N. Am�rique M�ridinale. Paris, Mariette, 1650. Beau col. ancien. Rousseurs, p�les muillures, fente en bas du pli central (sans manque). Bordures et cartouches colori�s � l'�pque. - Paper slightly age-toned, split in lower part centerfld, minor water staining and brown spotting. 390 x 553 mm. � Carte d'Am�rique du Sud grav�e par A. Peyrunin, avec les bordures et cartouches colori�s � l'�poque. 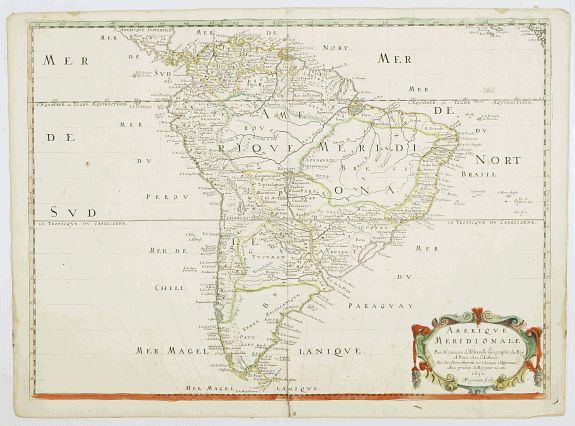 - Map of South America with scale brders and title cartouches brightly coloured at the time of publication. The map is engraved by Peyrunin. The coluring is uncommon, curious and very decorative.